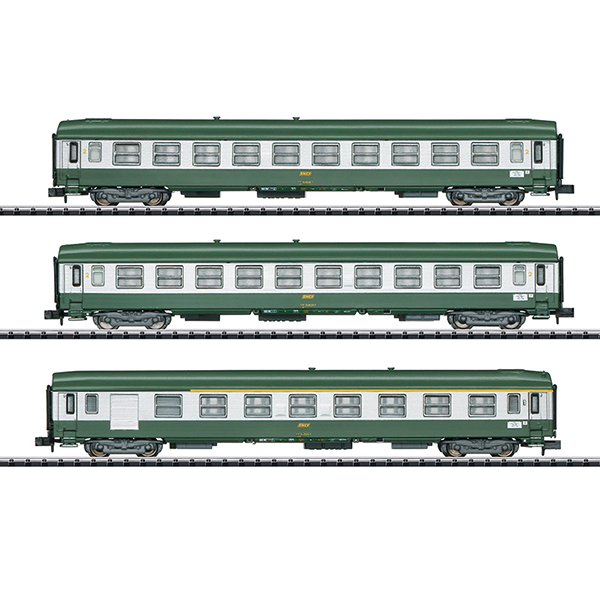 Prototype: French State Railways (Societe nationale des chemins de fer français / SNCF), 2 type B10 express train passenger cars, 2nd class, and 1 type A7Dd express train passenger car with a baggage compartment, 1st class. The cars look as they did in 1978 with the train route "Nizza – Paris". Model: The cars have a close coupler mechanism. An interior lighting kit can be installed in the cars later. Total length over the buffers 306 mm / 12-1/16". The locomotive to go with this car set is available under item number 16005. Price: Please call 305-279-8033 for your price. New items will be priced soon.